Giorgio Armani Sky di Gioia Eau de Parfum | Gemma Etc. Two of my all time favourite fragrances are from Giorgio Armani. Giorgio Armani Code has been my favourite going out scent for around ten years now, and is a scent I always repurchase whenever I’m running low as I couldn’t be without it in my collection. My other favourite is a more recent discovery; Giorgio Armani Si which I discovered early last year, and I have the original version and the Rose Signature version too. The newest Giorgio Armani fragrance launch is a special one, and one I fell head over heels in love with one spritz. I’m quite fussy with fragrance and I often find I have to use a fragrance multiple times to form an opinion but I knew I loved the Giorgio Armani Sky di Gioia Eau de Parfum £66 the moment I tried it, and I haven’t stopped gushing about it ever since. The Giorgio Armani Sky di Gioia Eau de Parfum joins the existing Acqua di Gioia, Air di Gioia and Sun di Gioia fragrances, to represent the water, air and sun elements of the untameable natural world. This year, the collection gained an ‘infinite space of dreams’ with Sky di Gioia. This floral spritz has been crafted using heritage techniques to make dew-fresh rose centifolia the heart of Sky Di Gioia. This is accompanied by the sparkling pairing of fruity top notes: fresh, juicy lychee in accord with crispy green pear; the two bursting out as one, like a ray of sunshine. The velvety luxury of peony overlays the rose quivering with drops of fresh, subtly salty Transluzone. Lastly, the white musk Helvétolide adds its accents of blackcurrant bus and blackberry leaves to this naturally feminine women’s perfume. 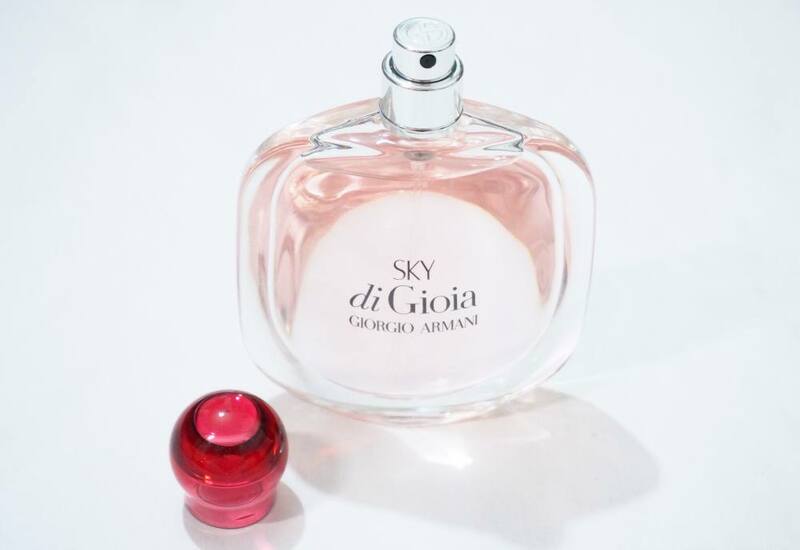 The Giorgio Armani Sky di Gioia Eau de Parfum bottle takes its inspiration from the very special palette of a Mediterranean sunrise, with a very pale pink shading to light and reflected in the pure glass, with the cap adopting a more intense shade of lychee pink. 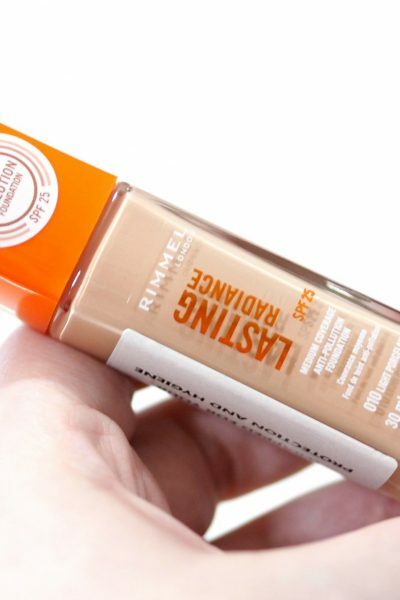 The bottle is so simple in its design yet it so sleek, with its rounded pebble-like design with soft curves and flat glass bottle. 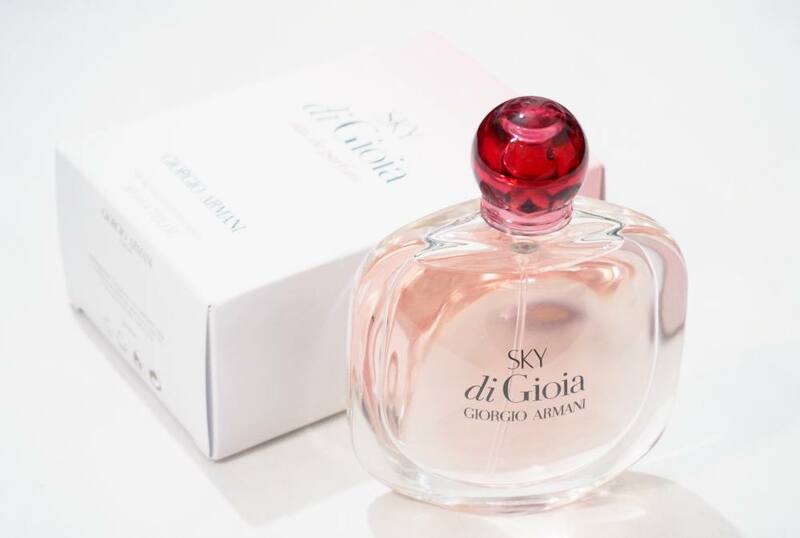 The very first time I tried Giorgio Armani Sky di Gioia, it instantly reminded me of Stella McCartney Stella, as well as Chloe Love Story and sure enough, on inspection of the notes they all share similar notes so if you like Stella and/or Love Story, you’ll love Sky di Gioia. I love Stella and Love Story, but I love Sky di Gioia even more as it’s considerably longer lasting which is amazing considering Stella and Love Story are already pretty longlasting perfumes. 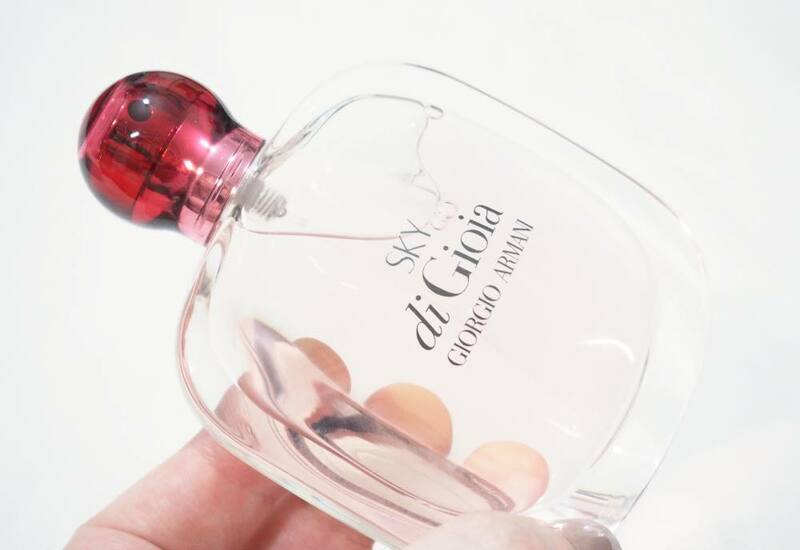 It’s such a beautiful, feminine, fruity floral fragrance which I can’t get enough of this Summer, and if you have similar fragrance tastes to mine, I really do think you’ll love Sky di Gioia. Have you tried the new Giorgio Armani Sky di Gioia fragrance?